China raced to contain oil leaking from an Iranian tanker stricken off its eastern coast Tuesday amid warnings the burning ship could spark an environmental disaster. Chinese firefighting vessel "DONGHAIJIU 117" sprays water on the burning oil tanker Sanchi at sea off the coast of eastern China on January 7. CF Crystal, a Hong Kong-registered bulk freighter, is seen at sea off the coast of eastern China on January 7. 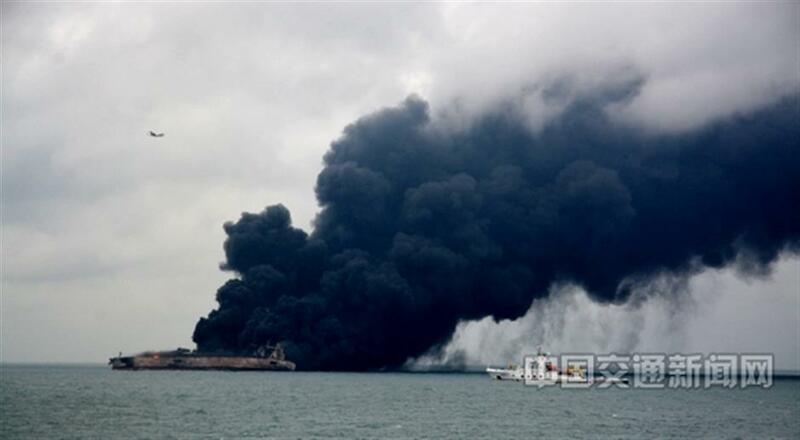 The Sanchi was carrying 136,000 tons of light crude oil when it collided with a cargo ship on Saturday and erupted into flames 160 nautical miles east of Shanghai. If all the cargo from the Panamanian-flagged 274-meter tanker spills, it would be the biggest oil slick from a ship in decades and could kill marine life across a vast area, analysts have said. The transport ministry said the vessel was still burning on Tuesday. It released a photo of the Sanchi enveloped in smoke and flames. "With the ship on fire, it is expected that much of this condensate oil will burn off rather than enter the water," Greenpeace East Asia said in a statement to AFP. "However, if the ship sinks before the oil burns off, the cleanup procedure would be extremely difficult. What is important now is to understand how much of that oil has burned off, and how much is leaking into the sea." 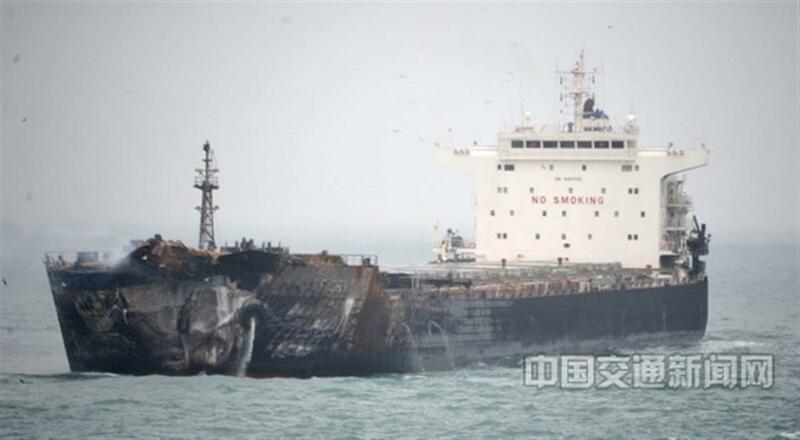 The Chinese foreign ministry said late Monday that cleaning ships had been sent to prevent "secondary disasters." Authorities widened the search on Tuesday for 31 missing crew members, with 13 search-and-rescue vessels "carrying out an uninterrupted search within 900 square nautical miles" of the tanker, China's ministry of transport said. The efforts were hampered by poor conditions at sea, it added, with rescuers battered with rain, wind and waves. The tanker "is in danger of explosion and sinking, and the toxic gas... is very harmful to rescue workers on the scene," authorities warned Tuesday. A vessel carrying protective suits, masks and gas testing equipment was sent to the scene Monday evening. The Sanchi was on its way to South Korea when it collided with the CF Crystal, a Hong Kong-registered bulk freighter that was transporting grain. The Crystal's 21 Chinese crew members were rescued, but most of the 30 Iranians and two Bangladeshis from the Sanchi are still missing. A "preliminary assessment" by China's transport ministry determined that a body found on Monday with a protective garment on it belonged to one of the Sanchi's crew members. A US Navy aircraft took part in the search on Sunday, scouring a wide area before returning to Kadena Air Base in Okinawa, Japan. A South Korean coast guard ship was also dispatched. The Sanchi belongs to the National Iranian Tanker Company (NITC), Iran's petroleum ministry said, and was transporting the oil to South Korea's Hanwha Total. The ship and its cargo were insured, a statement said.